West Palm Beach, FL – Hunters participating in the South Florida Water Management District (SFWMD) Governing Board's ongoing Python Elimination Program have achieved another important milestone for this highly successful initiative by eliminating enough snakes to stretch more than two miles in length and weigh more than 10 tons. An average of about three pythons have been eliminated per day from SFWMD lands since the program began in March 2017. 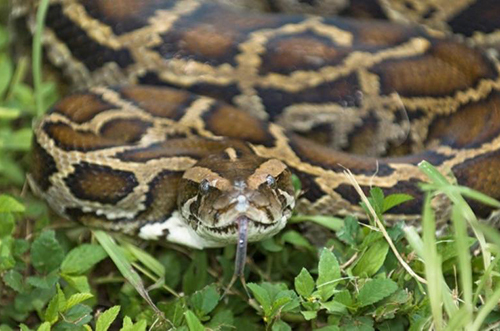 "This program continues to be proven successful over time because of each and every dedicated member of the team, from the Governing Board members who continue to fund it to the staff and the python hunters who work long nights to rid the Everglades of this snake," said SFWMD scientist Mike Kirkland, project manager for the Python Elimination Program. So far, python hunters have captured 1,711 snakes stretching a combined length of more than two miles and weighing a combined 20,864 pounds, or 10.4 tons. Hunter Brian Hargrove, a Miami native, has dispatched the most pythons, with 235 snakes eliminated as a result of the success achieved. The SFWMD Governing Board has funded the program for the entirety of the 2018-2019 Budget Year.